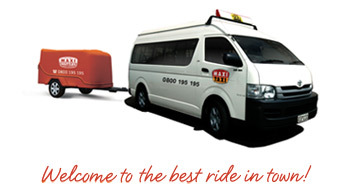 Maxi Taxi is proud to offer you an easy and affordable alternative to getting to and from major New Zealand airports. Our super friendly drivers will take you safely from door-to-door, to any flight on any day, without blowing your travel budget. We thought it was crazy that people could actually spend more on their shuttle ride than their flight. So we did something about it. That something is Maxi Taxi. Book in a jiffy, using this clever feature.